Assembled and Tested modules are custom built on demand and are typically shipped within two weeks of your order. Audio signals applied to the inputs of the 9748 Balanced Modulator appear at the output, with added new frequencies which are the sums and differences of the applied signals. Create complex tones characteristic of bells and chimes. Frequency doubling and de-tuned short-wave radio or robotic voice effects are other possibilities with single or multiple signal sources as inputs. 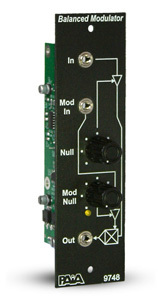 The module features separate Carrier and Modulation Null controls for optimum results with a wide range of input signals. To purchase the do-it-yourself kit, click the 9748K product page.